Fred Hollows has our Christmas Card for You - Expr3ss! We wish you all a wonderful festive season and the happiest and most prosperous of New Years! At Expr3ss! we’ve always believed in giving back. So instead of sending Christmas Cards, again this year we’re thinking philanthropy. Last year we added a Smith Family child sponsorship to our regular monthly charitable donations. 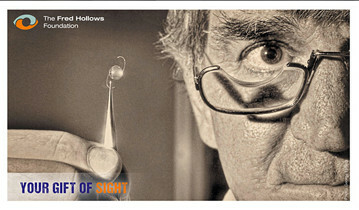 This year we’re looking Internationally and adding a second Fred Hollows Sponsorship. This is another continuing sponsorship: again, just like last year, we’re in it for life. So… Fred Hollows has our Christmas card for you this year. Hope you like it! We are sure you’ll be familiar with the Fred Hollows Foundation’s work. In 2014 they performed 728,788 eye operations and treatments, saving and restoring sight around the world. Why not check out their “What We Achieved” video … and if you find yourself motivated to donate too, that wouldn’t be a bad thing, hey? Tell us about it here! Of course, we continue our regular direct sponsorships of the The Smith Family, Médecins sans Frontières [Doctors without Borders] World Vision and the Royal Flying Doctor Service, all of which are doing great work too. We trust you’ll agree that we have chosen well again this year. Last year we also became sponsors of Variety SA through their V2 Motorcycle Run fundraiser which raised over $210,000 for children in need in South Australia. And we’re doing it again this year too, along with our sponsorship of emerging musicians through the Helpmann Academy Jazz Awards. Through our expanding “Value in Kind” programme, we also support the Can:Do Group of Charities, Challenge Community Services, SCOSA [scosa the Spastic Centres of South Australia Inc], Community First International, Workskil Inc, Careflight Group, Southern Cross Care, CirKidz, Variety SA and Variety NSW, Novita Childrens Services, RSL, Hands Across the Water, Community Living Options, Mary Mackillop Care. And we’re always delighted to add any not-for-profit organisation to this growing list… just give us a call.